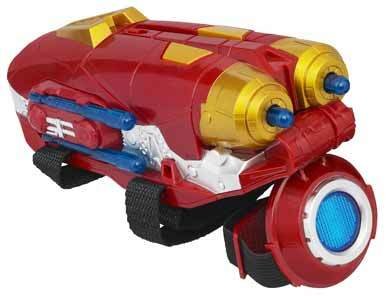 The Avengers: Iron Man - Tri-Power Repulsor toy is an incredibly well constructed budget gadget that includes electronic Iron Man sound effects, sound bytes and lighting effects to let kids reenact their favourite scenes from the movie. It requires 3 x AAA batteries (not included) for the light and sound effects to work. It comes with four plastic projectiles, which can be fired (two at a time) from the front of the unit (with storage space on the side to make sure you don't lose them when not in use). The unit is strapped to the hand so that with a quick flick of the wrist, the sound and light is activated. The missiles are fired by pressing buttons underneath each of the two spring-loaded releases. 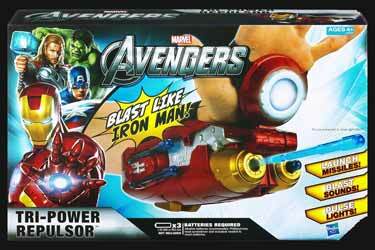 Retailing for £17, this is a great toy for any young Iron Man fan - especially when used in conjunction with Hasbro's other new Iron Man wearable items: the Mission Mask and Arc Light.